Fountaindale Auto Center in Frederick & Middletown, Maryland specializes in Maryland State Inspections. If you are buying or transferring a used vehicle in Frederick or Middletown, Maryland, chances are, you will need a Maryland State Vehicle inspection. Call Fountaindale Auto Center to schedule your Maryland State Inspection today. We offer Maryland State Inspections for cars, trucks, SUVs, and RVs in Frederick, MD and surrounding areas including: Middletown, Myersville, Hagerstown, Thurmont, Walkersville, Urbana, New Market, and Brunswick. What Is a Maryland State Vehicle Inspection? In Maryland, most used vehicles are required by Maryland Law to undergo a safety inspection prior to its sale or transfer. Generally, the seller or transferor of the vehicle is required to obtain the inspection certificate. How to obtain a vehicle inspection certificate in Frederick, MD? What happens if my vehicle fails Maryland inspection? If your vehicle fails to meet even one safety standard, the Maryland Inspection Certificate cannot be issued. You must have the problem(s) identified on the station’s inspection report fixed and then have the vehicle re-inspected by the same registered inspection mechanic at the same station. You have the option of fixing the problem yourself, having the inspection station fix the problem, or taking the vehicle to another facility for repairs. If the vehicle is re-inspected within 30 days after the original inspection date and you have driven it less than 1,000 miles, the inspection station will only need to inspect the defective equipment identified during the initial inspection. However, if a new defect is visually observed during the re-inspection, the newly discovered defect must also be repaired and re-inspected. How much does a Maryland State Inspection cost? The fee for an initial safety inspection varies with the inspection station’s labor rate. The Maryland State Police regulate the number of labor hours billed by the station for an inspection, but they do not regulate the station’s labor rate. 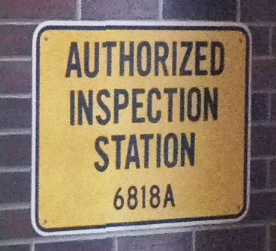 The fee charged for a safety inspection must be prominently displayed in each station. The fee for the re-inspection of a vehicle varies with the inspection station’s labor rate and the specific parts or systems that need to be re-inspected. A re-inspection fee should not be charged if the repair can be visually confirmed (for example, a burned out light) unless the inspection requires jacking, lifting, measuring, or testing the vehicle. A re-inspection fee for a non visual defect may be charged at up to 1 1/2 times the hourly labor rate if the inspection requires jacking, lifting, measuring, or testing the vehicle. You should inquire about the re-inspection fee before leaving the station. Fountaindale Auto Center will always strive for 100% customer satisfaction by offering our Frederick & Middletown auto repair customers honest, reliable and affordable auto repair services.